This article is about the boss in the Good Egg Galaxy. For the mission in the galaxy, see Dino Piranha (mission). Dino Piranha is a large boss in Super Mario Galaxy. He resides in the Good Egg Galaxy. He is found inside an egg when Mario first encounters him. The top of his egg becomes cracked when Mario crashes into him after being shot from a Launch Star on the preceding planet, thereby exposing his tail. Dino Piranha then begins moving slowly around the planetoid from inside the egg, and when Mario Spins the large ball on the end of his tail, the shell breaks, revealing Dino Piranha, initiating the battle. 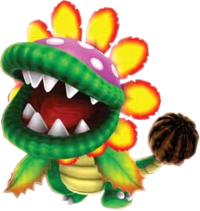 Dino Piranha, along with King Kaliente, Major Burrows, Bouldergeist, and Fiery Dino Piranha, also appears in Super Mario Galaxy 2 in the Boss Blitz Galaxy. A boss that very closely resembles Dino Piranha called Peewee Piranha appears in the first level of the Sky Station Galaxy. Dino Piranha must be fought a total of four times in both games. Dino Piranha's head looks similar to Petey Piranha, despite the fact that the color of his head is purple with white spots when relaxed, as opposed to red with white spots. His body is much different than Petey Piranha. Dino Piranha's body beneath the giant Piranha Plant head is that of a dinosaur's, (as would be expected given the name) with a green hue. His tail has a brown club at the end which may be inspired by the club of a real life Ankylosaurs. When he first breaks out of his egg his head is purple, but when enraged he turns red with anger. Dino Piranha also can be seen in the ending celebrating the Universe being recreated in Toad Town. This battle requires that Mario (or Luigi) skillfully use the Spin move to progress. When Mario arrives on Dino Piranha's planet, he will land on Dino Piranha's egg, cracking it. His tail and legs will pop out and begin to walk slowly around the planet. To fully crack open the egg, Mario must hit the large ball on the end of the Dino Piranha's tail using the Star Spin so that it hits his own egg and cracks the shell. Dino Piranha will then start to run around the planet attempting to attack Mario. Mario must run behind the Dino Piranha and Spin his tail once again, causing him to hit himself a second time, which will make him very angry. His head will turn bright red like Petey Piranha's head and he will chase Mario even faster than before. To finally defeat him, Mario must once again get behind him and hit his tail. After being hit a final time, he falls over, screams and explodes in a cloud of purple dust, releasing a Power Star. The player must fight Dino Piranha twice in the Good Egg Galaxy. The second fight will only be available when a Speedy Comet orbits the Good Egg Galaxy. In addition, a fiery version of Dino Piranha known as the Fiery Dino Piranha is fought in the Melty Molten Galaxy later in the game. Dino Piranha appears as an opponent during the Dream Spacewalk event in Mario & Sonic at the London 2012 Olympic Games. He resides on the Geo Planet from the Sky Station Galaxy. The player's main objective is to pass through the rings provided by the Lumas, then perform a Rolling Attack toward Dino Piranha. After taking several hits, Dino Piranha will spit fireballs at players who must perform a Spin Attack to send them back at him. The players must execute these methods repeatedly to defeat Dino Piranha and complete the event. In Super Smash Bros. Ultimate, Dino Piranha is mentioned briefly by Viridi during Palutena's Guidance dialogue for Piranha Plant. It is referred to in the plural form, implying it is a species rather than a character. The theme music while fighting Dino Piranha is the same as while fighting Tarantox and Fiery Dino Piranha. This page was last edited on April 6, 2019, at 00:38.